I made the following dish for dinner guests tonight and it came out wonderfully. It's pretty easy to prepare and a great way to nuts for flavor and texture! 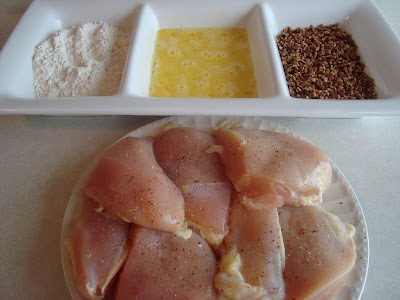 Cut the chicken breasts in half cross-wise and season with salt & pepper. In 3 separate containers, place the flour, whisked eggs + dijon mustard and chopped pecans. Take one piece of seasoned chicken and dredge in the flour, dip into the whisked eggs and roll in the chopped pecans to coat. Repeat for all pieces of chicken. In a hot skillet, heat the oil for frying on medium high heat. When the oil is hot, place the pecan crusted chicken pieces and fry until lightly golden, about 2 minutes on each side. 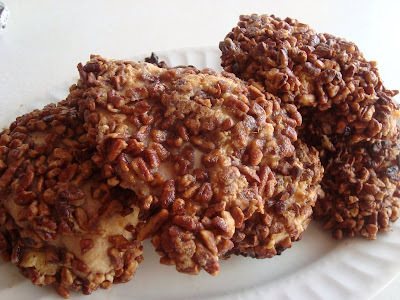 Be careful not to let the chicken fry for too long, since it will burn the pecans. The frying step is to ensure the pecans adhere to the chicken, as it will finish cooking in the oven. Once you have lightly fried the chicken, place on a lined baking sheet and bake in the preheated oven for 20 minutes. Remove from the oven and place a piece of foil to cover until ready to serve. 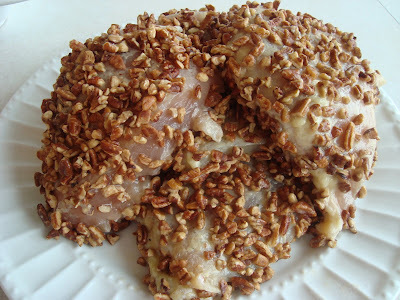 * This is great to serve with a drizzle of honey right before serving! I love coating chicken with pistachios or pecans. Looks great!